The relationship between the EU and Latin America has always known large fluctuations of interest. The relationship between the EU and Latin America has always known large fluctuations of interest. Like other Spanish, Portuguese, and Italian EU leaders before her, High Representative Federica Mogherini seems to be a strong proponent of a deeper and more concrete dialogue with the region. She makes this clear by attending important events like the Summit of the Community of Latin American and Caribbean States (CELAC) in Costa Rica, and the EU-CELAC Civil Society Forum in Brussels. This renewed interest comes after a period dominated by obsolete rhetoric which has failed in its attempt to seal negotiations at sub-regional levels with the Andean Community (CAN) and the Southern Common Market (MERCOSUR). Indeed, the only success story seems to be Central America, in which Europe’s intentions were concretely manifested through the signature of an Association Agreement with three components: development, trade and political dialogue. For CAN, on the other hand, the deal was only completed with Colombia and Peru. The Agreement with Ecuador is still pending ratification, and Bolivia withdrew from the negotiations. MERCOSUR seems to be an even more complicated scenario, as practically all important EU objectives are also objectives for the MERCOSUR countries (especially with regard to agriculture), and these EU interests are opposed by developing industries in the Southern Cone. 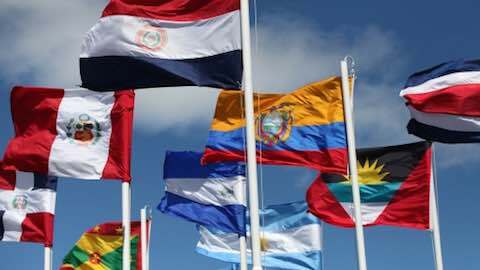 On a more general level, the EU held its first summit with CELAC, the forum for all Latin American and Caribbean countries, two years ago in January 2013. The plan that emerged from this summit aimed to create more concrete cooperation frameworks between the two regions, especially in sustainable development, corporate social responsibility, education and poverty eradication. Yet two years later, the EU and CELAC seem to have different positions on two main topics that are dominating the international agenda. On post-2015 sustainable development goals, CELAC supports the full application of the recommendations of the United Nations Open Working Group, while the EU is more flexible in this respect. On the Convention on Climate Change, both parties may support a legally binding agreement, but have different visions on how it should be applied, even in Latin America. There have, however, been some positive developments. The EU-LAC Foundation has recently initiated a dialogue with the aim of finding solutions for youth unemployment, a project with a great deal of potential to give more visibility to interregional cooperation. Additionally, the dialogue between the regions at business, academic, and civil society levels has led to increased mutual understanding and created the basis for an improved official strategy for enhanced cooperation. The second EU-CELAC Summit, to be held in Brussels this June, offers the opportunity to gain political momentum by relaunching the partnership between the two regions. Such a renewed effort should focus not only on trade, but also on the post-2015 development goals and the Agreement on Climate Change to be negotiated in Paris this year. This progress is crucial, as the EU faces fierce Chinese competition and a completed CELAC-China cooperation agreement, celebrated at a summit in Beijing in January, 2015. The United Nations Economic Commission for Latin America and the Caribbean predicts that China will surpass the EU as Latin America’s second-largest trading partner by 2016. The Summit in Brussels will also offer a window of opportunity for the EU to consolidate its position as global actor, and to build a stronger partnership with one of the world’s most promising emerging regions. As a region divided between countries which still count on the US as their main trading partner (Mexico and Central America) and countries trying to build their relationships through South-South cooperation, Latin America is a region in which the European Union needs to build a coherent narrative. The EU has an opportunity to win a seat at the table by offering an alternative partnership through which the LAC countries can find their way out of the middle income trap, a future danger for some LAC countries and an evolving reality for others. This could be the start of the EU-Latin America dialogue as an affair of two. Ileana Daniela Serban is a PhD Researcher at the University of Warwick and a Research Fellow at the University of Liege, the CEFIR Center and the King Baudouin Foundation. She has previously worked in the European Parliament and in academia. Latin America: "EU-Latin American Cooperation: An Affair of One?"